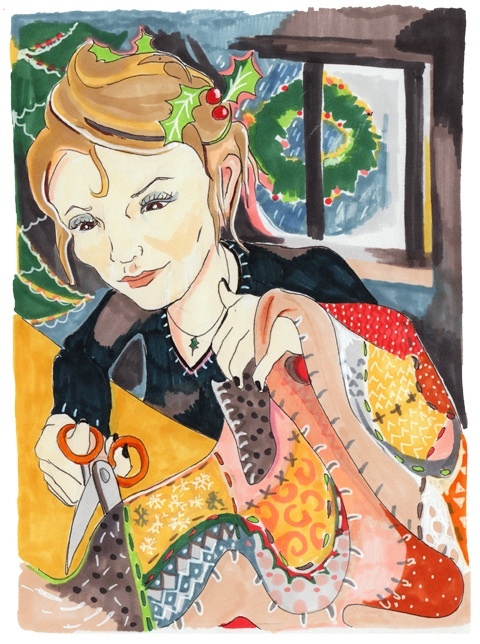 It is Christmas and what better way to induce a good dose of festive cheer and combat the evils of mass consumption than to do some Christmas crafting. 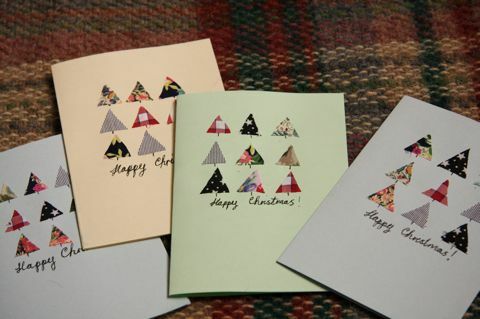 Here Hannah Bullivant shows you how to make some simple Christmas cards. With illustrations by Emma Block, Daria Hlazatova and Ellie Sutton. You may think that Christmas cards are harmless tokens of festive cheer, sale but there is more to them than well wishing tacky Santa’s. When done well, with thought, they have the potential to convey festive cheer, bring good news and even re-kindle relationships. They can also, however, be completely pointless (dear Dave from Sam. Why bother) cause large levels of guilt, highlight your own lack of organization, and generate sit-com levels of gossip and rumour (“Drunken Unkle Nigel is SO off the list”). Manufacturing and sending Christmas cards wastes thousands of tonnes of carbon every year, and most of the cards end up in landfill anyway. In fact, you might very well decide simply not to send them, and I really don’t blame you. (Full of Christmas cheer, I am.) 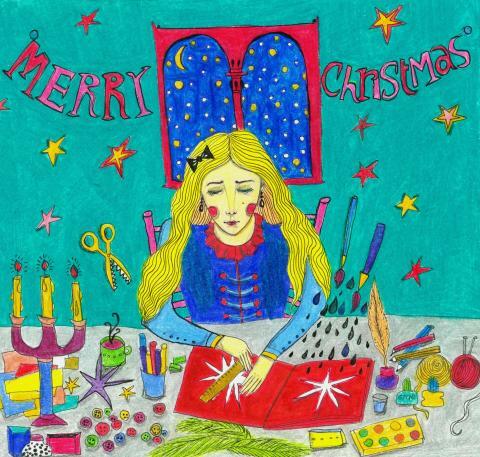 Alternatively, to be slightly less of a scrooge, you could join me in making just a few cards, to accompany presents or perhaps as presents. 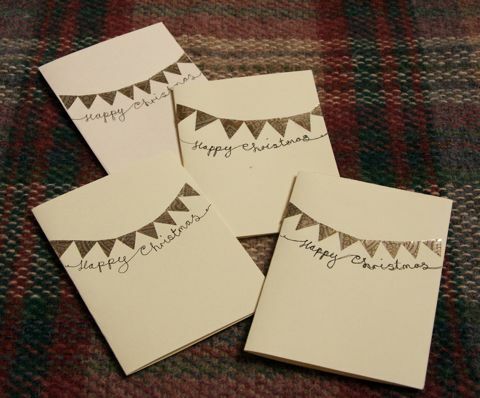 Here are a few ideas for some very simple and quick home-made cards that anybody could make, (even if they don’t consider themselves to be very crafty.) They are made with materials that most people will have lying around or within easy reach, and are designed to be very simple to make. 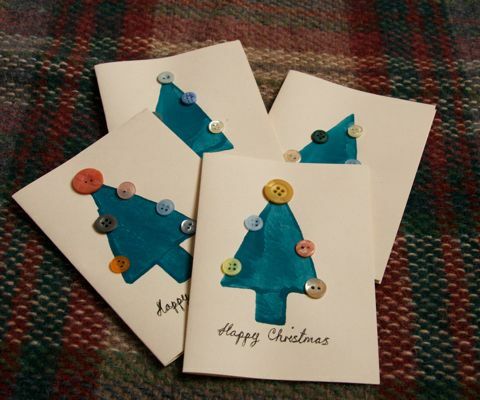 A home- made card will be received much more warmly than a selection from an Asda multi pack, it will save lots of money, and making them is bound to make you feel festive. So stick some cheesy Christmas music on, pour yourself a glass of mulled wine and get stuck in. Firstly, the easiest of them all, the potato stamp. Oh how I love the humble potato stamp! (I have written about the joys of potato stamping before ) A great craft to do with kids, its also fun for a big kids (ahem) and you can produce loads of cards very quickly. Carefully carve your potato with a knife into the shape you desire. Get your card ready first then stamp away. 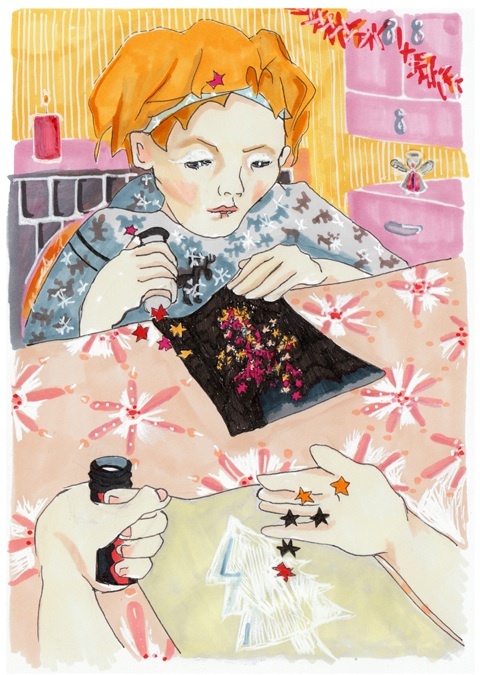 Decorate with sequins, doodles, pressed flowers, or buttons, as above. You can buy recycled card here. Save your wrapping paper and cards, cut them into little triangles then stick them across pre folded card with glue to make festive mini bunting. I saved the gold paper above from a birthday present and it has come in very handy for my Christmas cards. If you don’t fancy your chances at fancy handwriting, print your Christmas message out in a nice font. I googled origami Christmas trees and found these easy to follow instructions. I recycled newspaper, the pages of an old book and some old maps and folded them into these Christmas cards/decorations. I used a few dabs of glue to secure the folds then strung each tree with a bit of thread and wrote my Christmas message on the back. 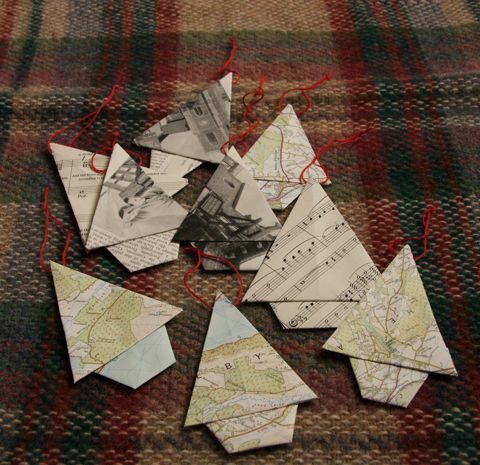 Here I have used up some of my tiny fabric scraps (which I keep) to cut out triangles to make into mini trees. 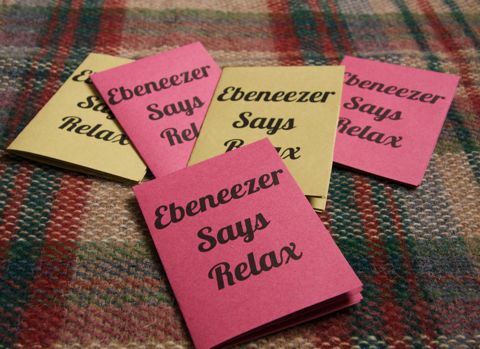 •	Remember also that you could also send an E Card if the mood takes you. Use the designs from the clever people at 10:10, or if you are a decent drawer (hello illustrators) then you can draw something amazing and send it as an e-card. Or how about a video card with a stop frame animation? Lots of effort but WAY COOL. •	Keep decent wrapping paper too, it comes in very useful for a number of crafty purposes, including the projects above. I’ll be back later this week with some more ideas for home made Christmas fare, and a wee bit of a rant. 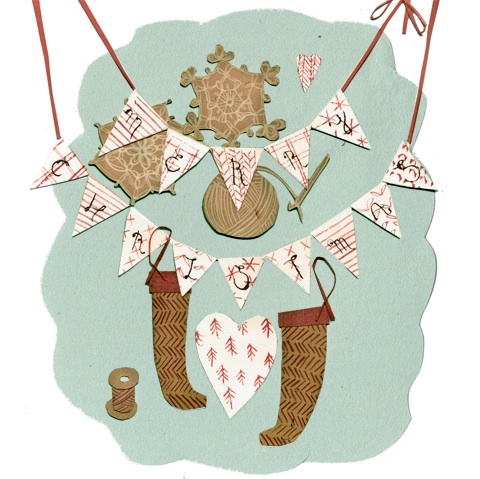 Happy festive season to you, dear readers. Where was this tutorial 2 weeks ago, eh? Eh? Haha….I’ll have to bookmark these ideas for next year. You’re so good at these crafty things, Hannah! Sorry Elizabeth! I will try to post earlier next year! It may not be too late, you could make a few of these to go with your presents maybe? !